Today marks the start of dineLA's winter edition of Restaurant Week, and this time around some pillars of fine dining in the city have joined in to offer their own tier of prix fixe. Perhaps they were inspired by Melisse's inspired move last year - they couldn't find a fit for the highest prescribed tier of dineLA (3-courses for $45), so they had their own "dineMelisse" timed to Restaurant Week, but with a prix fixe more appropriate to their category of $75 (for 5 courses). I loved Melisse for offering this last year, as afterall, the spirit of dineLA was originally to allow people to break out of their comfort zone, and have new culinary adventures / experiences at places they'd never been to - by bringing menus at a more affordable price. That a fine dining establishment understood this and made it possible for the non-independently-wealthy to experience it for the first time, was fantastic. This year's select group of fine dining restaurants participating in dineLA will be doing it for $85. I'm excited to see what they will offer, as at their caliber I would expect them NOT to succumb to the more self-defeating 'cost effective' beef or chicken dinners. I didn't get a chance to post about dineMelisse last July, and wanted to take the opportunity to do a recap here as I think it really gives a great idea of the high standards Melisse maintained even with a Restaurant Week deal (I put their name now next to Craft as my favs for exemplary food and service, people who really take pride in their work regardless of the occasion). Amuse bouche - our favorites here are the gorgeous jewel-toned, perfect little cherry tomatoes encrusted with crushed pistachios. Creative, beautiful, and a delicious way to kick off the meal. Here is the dineMelisse menu. As we happily drooled over the food menu, our craft cocktails arrived. The blogger part of me had wanted to order different drinks so we could try out more, but my friend and I happened to have the same taste pretty much, and Steve Livigni / Pablo Moix's Les Restes immediately had us at lychee, crushed grapes and egg white with Death's Door vodka - and it tasted as light, delicate and refreshing as it sounds. A second set of amuse bouche. I don't normally take photos of bread service, but the bread was amazing here: I especially loved the basil brioche, which I only very reluctantly and forcibly had to stop myself from eating second rounds of - though our servers very generously came around to offer (had to save room for the actual meal!). Then came Course 1: Ahi Tuna Tartare with avocado mousseline, cucumber and yuzu. The tuna and avocado (and even cucumber) pairing was not new, but the addition of yuzu to cut through the richness of the other ingredients was perfect. Course 3: Chatham Bay Cod braised shelling beans, mushrooms, smoked tomato. The list of ingredients sounds simple, but when the best ingredients meet with culinary craftsmanship - you get a dish like this that haunt you for weeks after your first bite. The fish was perfectly cooked, tender, flaky, subtly sweet, elevated to another level of sophistication by the sauce which conveyed somehow simultaneous heft and depth (in smokiness) with levity (airy foam). Easily our favorite dish of the meal, if not for the presence of my kryptonite in the next 'bonus' course: black truffle. (Not part of dineMelisse prix fixe) Between courses 3 and 4, for an additional $25, we were able to get an extra black truffle course! With real earthy 'black diamonds', brought out for us on a tray for us to indulge in its intoxicating fragrance, whetting our appetites before the risotto arrives. It was so worth the extra $25. The black truffles were shaved at the table over our bowls of risotto. Though it was summer time, they managed to use black truffle, not its too-mild-mannered (and to me bland flavored) cousin the summer truffle. Course 5: Passionfruit Souffle Glace coconut sorbet, pistachio and lemongrass. A perfect way to end the meal, light, balanced, notes of tropical sun without going overly sweet to counter the richer dishes before it. All in all, an amazing first meal at Melisse and I look forward to more, especially with this next iteration of dineLA or client meals! They had me at Naked Cowboy Oyster, Dungeness Crab, Wagyu Beef Tartare and Devil's Gulch Quail. And, based on (1) the regular prix fixe menu being $125, it would be rare that I would get a chance to eat here, if not for dineLA and (2) the great experience last year with dineLA, I would return again to check out this year's offering.. The 'teaser' dish is listed on their regular dinner menu as an antipasti for $18 - though not sure what the dineLA portion size will be like. But the dineLA menu has many options that make my eyes and mouth water. Starters include jumbo shrimp, grilled octopus with squid ink fregula, and 'orange sized' arancini. First courses feature magic words: porcini, veal, wild boar. Second courses: duck breast, cioppino, lamb stew. Make a day trip of it, reserve one of the weekend dates (1/25 or 1/26) and enjoy the oceanfront Terranea property in Palos Verdes when you head down to mar'sel. The dineLA menu consists of your choice of 6 small plates. Not sure how much you would save, but if you have been wanting to check out this place and/or take a date here for the location, but wasn't sure because of pricing...now may be the time, when you have a 'safety' on your bill. My picks from a maximization perspective would be: Pate de Campagne, Halibut Cheeks, Lamb Sausage, Crispy Duck Confit, Spaghetti & Meatballs, Spiced Dark Chocolate Tart. For those who are not into desserts, the mysterious sounding Kale 'Wich looks interesting. Do share your pics / intel on these if you go! 1MB Travels: Montreal: Au Pied de Cochon and "The Family That Pigs Out Together..."
This Christmas, our family congregated in Montreal for the first part of our annual holiday vacation together. Knowing that my first order of business when it comes to food, whenever traveling out of California, is and always will be foie gras - and wanting to share one of his best experiences of foie ever, my awesome brother made a reservation at Au Pied de Cochon (widely recognized as THE place to go for foie, and where Anthony Bourdain had an epic meal that the chef instructed his staff not to stop until his death presumably from gorging...) months in advance. The week we were in town, temperatures dropped to between 1 and 15 degrees Fahrenheit. Snow ploughs raged through snow blocked streets every few minutes to make it even possible for cars to make it through at all. But nothing could stop us, not even driving around for blocks to find parking spots not obstructed by 3 feet of snow. 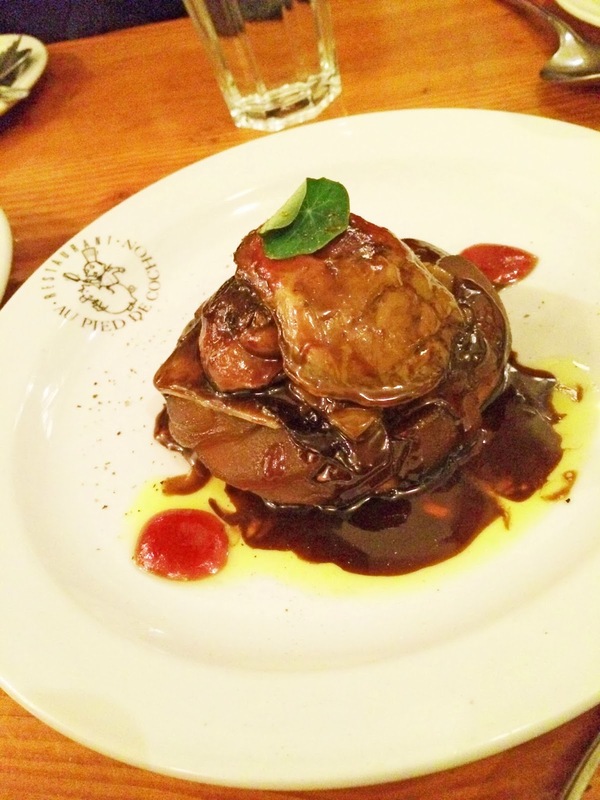 Apple Foie Gras - The simply named dish had a luscious and generous lobe of foie atop an apple tart, draped in balsamic vinegar. A strong start to a fantastic meal. Onion Soup (CDN$9.00) - my dad LOVES French onion soup, and probably had already downed about 6 bowls by the time I landed in Montreal. But this one was not like any other - under the familiar thick layers of cheese, was not only french bread soaked in rich caramel colored broth - but a giant lobe of foie. You'd expect it to be overwhelming, but it added a creaminess and earthiness to the soup that was other-worldly. 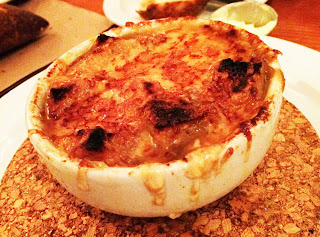 This was definitely one of the best french onion soups we've ever had in our lives. Foie Gras Poutine (CDN$23.00) - this was the best of meal as far as I was concerned. 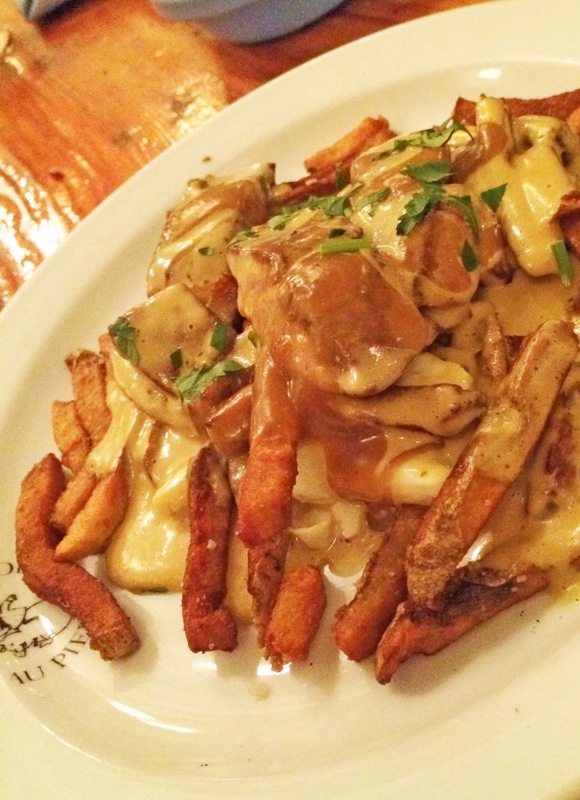 A big fan of the Quebecois specialty poutine (fries topped with gravy and cheese curds) to begin with, I was ecstatic to experience this version, made richer with chunks of foie and a foie-based mayo type sauce that was instantly addictive. We inhaled the entire plate in minutes, and I could have spent every day of the rest of the vacation eating just this one dish, and I would have finished the year a happy foodie. For our mains, there was the Veal Chop with Foie Gras Sauce - a special for the day. 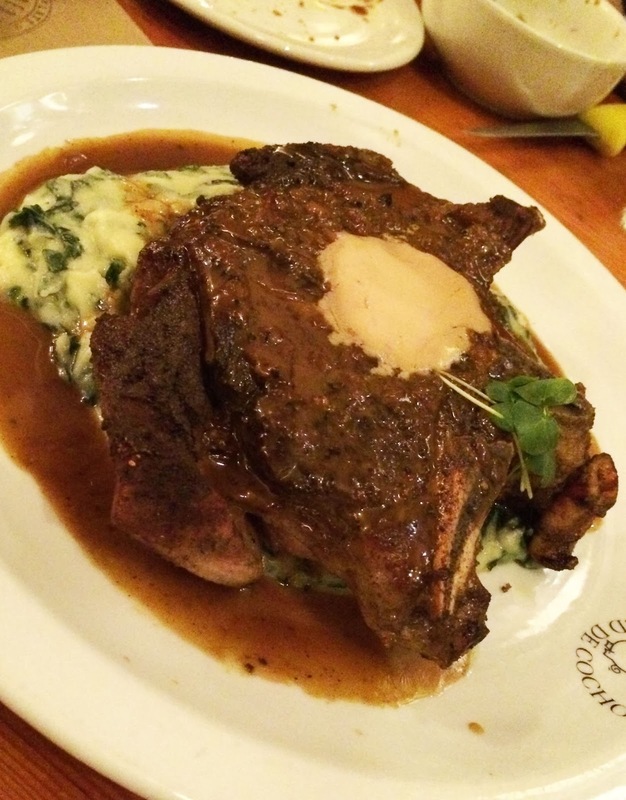 The chop was gigantic, tender, and punctuated with a pool of foie. We thought about getting the "naked foie", which my brother had before, just a giant pretty much whole lobe of foie, but it was too much to handle, and we compromised with one foie-free dish: Happy Pork Chop (CDN$25.00). 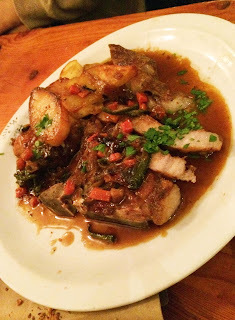 Turns out it was a great choice, the pork was juicy, melt in your mouth tender and flavor-packed. This was an amazing meal for many reasons other than a massive dose of my favorite food...I was moved that my brother, knowing it would be difficult with a toddler in tow, and traveling across town in serious winter weather, would make the effort to ensure that I got to experience this. My parents, who have become more health conscious and cut back on the amount of food, especially fatty foods, they consume, in recent years - being good sports to indulge and enjoy. The entire staff at the restaurant also went above and beyond to be accommodating, even when my normally adorable nephew started to express in no uncertain terms that he was 'all done' with the lengthy dinner. Sated afterwards, we piled out into the night to find that our rented car, a Jeep, no less, was stuck with several feet of snow lodged resolutely behind the tires. Family bonding time ensued with us getting on our hands and knees to dig out our wheels out armed with nothing other than a toothpick of an ice-scraper (intended for use on loosening thin layers of snow or ice on the windshield, not for full on shoveling of mounds of the stuff) and sheer will. We made it out, of course, and it was all worth it. It's truly a blessing to be able to spend quality time with the fam this holiday, and have everyone healthy, safe and savoring the time together. Au Pied de Cochon, thanks for the fantastic foie-filled night out - and hope to see you again soon to try the rest of the menu (a bientot)!